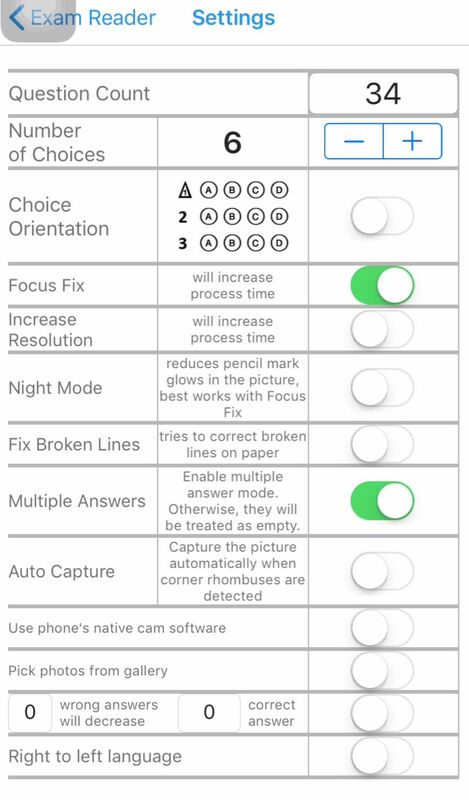 Grade & score multiple choice tests, quizzes, and assessment papers by using iOS (iPhone, iPad) or Android or WP device's camera as a scanner. It can also read over-written marks. %100 success rate if used as described. Supports from 5 to 200 questions or more. Both horizontal and vertical sheets can be used (it is a first in this kind of application). Teachers can make their own sheets with a word processor (also a first). You can manage your classes, students, exams and results with ExamReader Cloud. It will give you intelligence about your students and exams. Question Count: This must be equal to the number on the paper. Number of choices: This must be equal to the number on the paper. Choice Orientation: This must be equal to the orientation on the paper. Focux Fix: If enabled, the program tries to sharpen the shaky shots. PS: Slows down the processing time. Increase Resolution: If there are more than 100 questions and you have trouble grading the paper, try to enable this option. PS: Slows down the processing time. Night Mode: Under a lamp light, if there is light reflection on paper, enabling this option can reduce the reflection and you can get better results. I recommend an acrobat desk lamp so that you can arrange the light not to drop directly on paper. Also, using a parchment paper as a filter can be an option. PS: Slows down the processing time. Fix Broken Lines: The lines and rectangles on the paper must be intact and not broken. If there are minor breaks on the squares around the choices, you can enable this option to correct them automatically. PS: Slows down the processing time. Multiple Answers: If one question has multiple correct answers, you must enable this option to grade them correctly. Auto Capture: If enabled, when using the app's own camera screen, when the program detects the corner rhombuses around the paper, it will take the shots automatically. PS: Increases the memory and cpu usage. Use phone's native camera: When enabled, the program opens the phone's own camera app to take the shots. Pick photos from gallery: If enabled, the program allows you pick photos from a file instead of taking camera shots. X wrong answers decrease X correct answer: By enabling this option and inputting the values, you can change the calculation of the net score. For example, you can input 1 wrong answer will decrease 0.25 correct answers. You can watch the basic usage tutorial and learn the features of the program. 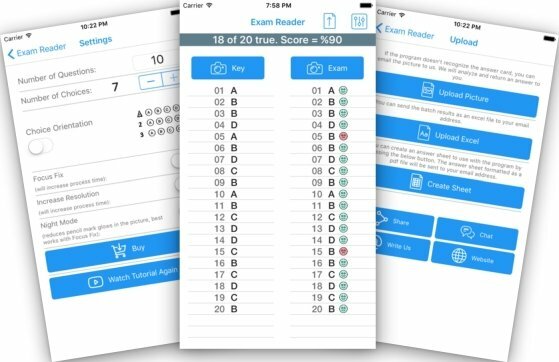 Commercial users can publish exams that can be graded by the students themselves to see their ranks among the participants that took the same exam.